VENTURA, CALIFORNIA: From now through November 30, the 2017 Mugs Stump Award will be accepting grant applications from small climbing teams with fast and light alpine objectives. Established in 1993 to honor the late Mugs Stump, each year the Mugs Stump Award provides grants to a select number of individuals and teams whose proposed climbs present an outstanding challenge—a first ascent, significant repeat or first alpine-style ascent—with special emphasis placed on climbers leaving no trace of their passage. Sponsored by Alpinist Magazine, Black Diamond Equipment, Ltd., Mountain Gear, Patagonia, Inc., and W.L. Gore & Associates, Inc., the Mugs Stump Award encourages individuals teams from North America to submit their applications for a part of this year's $25,000 in grant funding. Mugs Stump was one of North America's most prolific and imaginative climbers until his death in a crevasse fall in Alaska in May 1992. Best known for his first ascent of the Emperor Face on Mt. Robson in the Canadian Rockies and his triptych of brilliant Alaskan climbs—the East Face of The Mooses Tooth, the Moonflower Buttress on Mt. 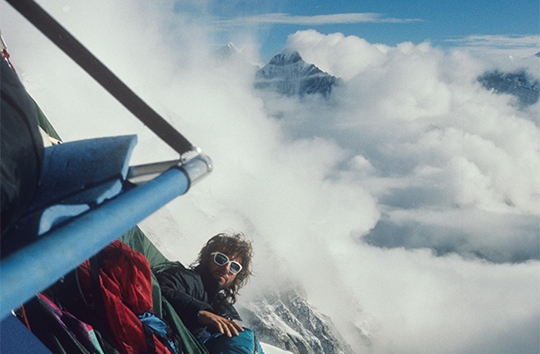 Hunter and a one-day solo of Denali's Cassin Ridge—Mugs was the complete climber, adept at all forms of the game. Climbers who share Mugs' vision of climbing as a celebration of boldness, purity and simplicity are encouraged to apply. Past recipients include both well-known and relatively unheard-of alpinists pursuing objectives in Alaska, Patagonia, the Himalaya, the Canadian Rockies, Greenland and more. Details can be found at http://mugsstumpaward.com/winners. Further information and applications are available at mugsstumpaward.com. Climbs taking place between February 1, 2017 and March 1, 2018, are eligible. Applications must be submitted via email to mugs_stump_award@patagonia.com (subject line "2017 Mugs Stump Application"). Awards will be announced at the Bozeman Ice Festival occurring December 7-11, 2016, and published online by December 20, 2016.